Nowhere is the mantra ‘customer convenience is key’ more relevant than in the telecoms industry. To survive and succeed in this super-competitive, product-parity market, it’s essential to make the customer’s life as easy as humanly possible. Or more accurately, as easy as technologically possible. This holds particularly true for bill delivery and payment. And not surprisingly, email is playing an ever more pivotal role in this regard. Research confirms that the average internet user spends 96% of his time online in his inbox (Jupiter Research). But before we look at the very near future, let’s take a brief glance at the recent past. Then came email. The inbox: the postbox of the 21st century. In no time at all, three of the four types of mail made their way directly into your inbox. But even today, one type of mail is often conspicuously missing: your bills. Why is that? One can only guess that some billers prefer to just notify you of your bills and pull you to their website to view and/or pay them. But wait a second – shouldn’t the convenience of the customer come first? Imagine if the inbox was still a postbox. That would be like dropping a little notification slip in the post saying there’s no need to bother you with a paper version of your phone bill, you just need to pop around to our offices to collect and pay it. Quite convenient in one respect, sure. But the reality is, ‘quite’ convenient just doesn’t cut it. The very reason email has replaced snail-mail is because it’s so much faster and more convenient to use. For effective management of communications – like bills – the email inbox is the customer’s environment of choice. (Remember, the average internet user spends 96% of his time in his inbox.) So why are companies still asking their customers to leave this environment in order to pay a bill? Whether you’re asking the customer to make an online visit to your website or an offline visit your building, a visit takes time. It’s valuable – and indeed, unnecessary – time which the customer would rather not spend. Being pulled to your website to view or pay his bills simply isn’t considered enough of a short-cut, particularly when he has several suppliers and is being asked to fetch his bill from each one. So when you consider the mantra ‘customer convenience is key’, there’s really no logical reason why your phone bills aren’t already in your customer’s inbox. It’s only a matter of time before they are. The question any competitive telecoms company should be asking of themselves is this: do we want to be seen as one of the first to provide this convenience, or one of the last? And while this alone is ample reason to provide a secure e-Bill payment service, the benefits to the telecoms company go far deeper than general customer convenience. Another big area for opportunity is cost-cutting. 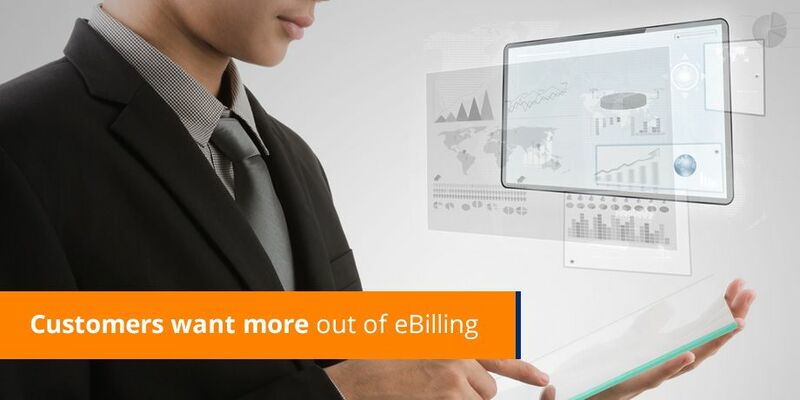 e-Billing can nullify the need for the company to print bills and statements. Which is not to say that a ‘hard copy’ can’t be an option provided to the customer for his convenience. In fact, it’s advisable. And those who prefer the old method of payment can simply press ‘print’ at their own expense and post the paper version to the company. But in due course, the likelihood is that the e-Billing process will eradicate the need for paper altogether. A further advantage is the enormous potential for the telecoms company to interact with its customer. The flexibility offered by the electronic bill format can be useful to both parties on many levels. Apart from fast, easy payment, a secure e-BiIl offers the ability to: sort your data by value / date / amount etc, split your bills into ‘business’ and ‘private’, change or update your own personal details, graph and compare bills from previous months…to name a few. Each of which creates greater convenience for the customer, entrenching their loyalty even more. An e-Bill’s electronic functionality also allows the company to deliver personalised, targeted marketing communications to the individual customer, making cross-selling or up-selling a simple and unobtrusive – even welcome – process. In the end, there are many advantages to delivering your bills securely via email. But the biggest advantage of all is that’s what the customer wants.